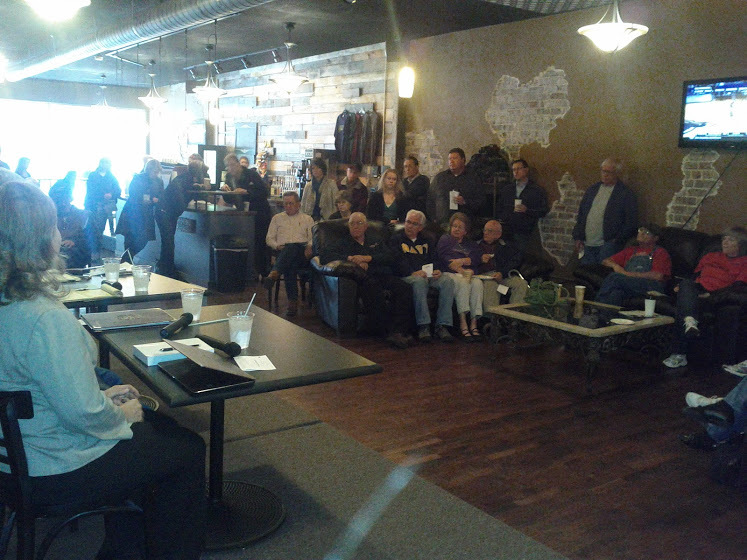 Saturday at 9 am there was a legislative update at the Common Ground Coffee shop on Main street. 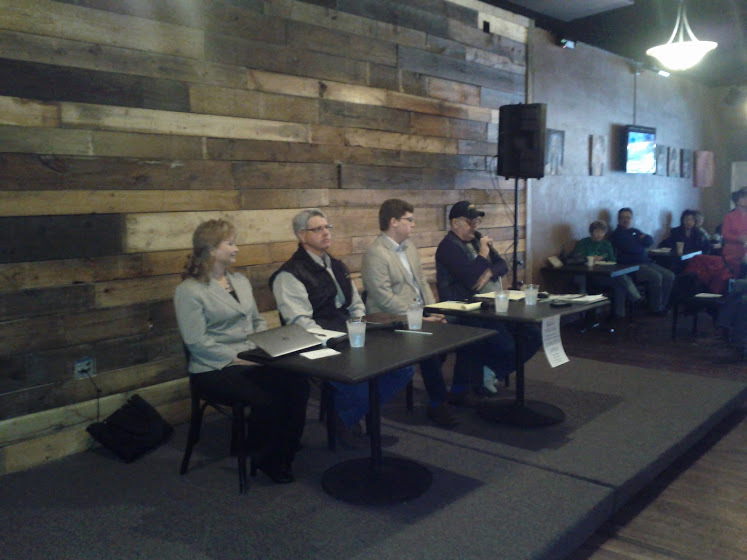 Legislature members who were present were, Bob Grant, Marty Read, Caryn Tyson, and Jake LaTurner. Marty Read talked about working on bills that would protect the rights of gun votes and mentioned that he was disappointed with recent legislation that will allow sexually oriented businesses within 1000 feet of a school. Bob Grant represents the second district which includes a small piece of Bourbon County. He is on the appropriation and transportation committees. He mentioned that he is disappointed with the way that KDOT and KTA were being combined in a way that seems to be designed to allow the state to take money from KTA through KDOT. Grant also mentioned that he doesn’t feel Kansas should model itself after Texas and Florida who have done away with their income tax. Jake LaTurner said that he pledged not to raise taxes. He feels that the current legislative session is on of responsibility and of trying to fix problems that have been building up over the years. He also has been supporting drug testing for people receiving unemployment benefits. He has introduced a bill to reform Kansas Open Meetings Act to require people to take minutes of meetings and cap prices on requests. Caryn Tyson said this has been an interesting session because the dynamics of both chambers are different because there are so many new members and it is hard to anticipate what is going to happen with new bills. She said lobbyists and special interests are trying to push through bills that wouldn’t have passed before. She talked about the bill drug testing for welfare recipients. It will require testing if there is suspicion of drug use. She is fighting to keep from losing the mortgage tax deduction. She is also excited about a bill that will allow veterans to note this on their drivers licence. Susan Brown from USD 234 asked about the bills that will effect education. In particular she asked about cuts to at risk funding. Caryn Tyson said that the current At Risk Funding is based on the free lunches in a district. She said they are concerned that the free lunch program isn’t being audited very well and may be keeping money from going to the schools that need it. That is why they are looking at changing the formulas that determine this. Jake LaTurner said he doesn’t support the bill in its current form because he wants more money for education in the districts he supports. He went on to talk about how there have been many schools suing the state for not properly funding education. He talked about a recent case that said the funding was unconstitutional. He feels this is a legislative issue and the courts shouldn’t be legislating from the bench. He pointed out that if people don’t like the funding they should “fire” their representatives and elect someone else. Bob Grant said that the legislature “in it’s wisdom” gave the courts some oversite to how much money is spent on education. Marty Read talked about how there is a big difference between the way that money is getting distributed between wealthy and poor school districts. He said he would like to see the money going right into the classroom. He would like to see good teachers getting paid more money. Mayor Adams said that he felt the bill that would require partisanship in local elections was a bad idea. Grant said he opposed the measure. Read said he wasn’t excited about it, but he did feel that moving the election to November would be better. Tyson said she would like to move it to the odd year November for local government. Alan Warren asked to hear some updates about changes to the way taxes are being applied to fixtures. Tyson talked about a business in Montgomery county that had a $400,000 tax bill that suddenly jumped to $10 million dollars, sued the county and won. She said there is a bill to try to balance this to fix problems in two counties without messing up businesses in a bunch of other counties that aren’t having a problem. She said that the bill the passed in the house had some language that could hurt small counties. She said that the confusion has to do with whether property is real or trade and gave the example of whether a washer and dryer should be considered property or personal because it is attached to the building. Bob Grant said this is kind of a hot issue but not really because it only impacts to counties at this point. He said they need to balance in order to keep these businesses from moving without hurting all the other counties. There was some discussion about a bill that would either people at colleges to carry guns or require schools to have metal detectors in order to make sure that no one has guns on campus. Bob Grant said he would like to see campuses have the flexibility to vote and make their own decisions regarding guns. Caryn Tyson talked about how they feel like they are working on a lot of issues just to counter the federal government. She pointed out that the federal government wanted to prevent anyone under 16 from working on a farm and through the efforts of the state legislature the federal government backed off on what they were trying to do. Advanced voting for this election begins on March 19th and the actual election is Tuesday April 2nd. Jamie Armstrong – Born and raised in Fort Scott. Hopes to bring a well rounded view of what we need to move Fort Scott to the top of the list of school districts in Kansas. Kevin Allen – Known as Skitch. Lives in the county, but owns property in town. Has a lot invested in the school system with his kids. Conservative with his business and would bring that to the school board. Keeps an open mind–open to change. Belynda Davenport – Lived here all her life. RN who teaches for the college. Been on the school board for the last two years. Says it has been a learning experience. Kevin Allen was asked “What is the most important role you’ll fill if you are elected?” Said he will be a good listener and feels his record on the city commission shows that. Feels he is open minded to change. Works hard to make sure he doesn’t become resistent to change. Belynda Davenport was asked the same question. She feels her most important role is to support the new superintendent and making major decisions and policies with the school district. Jamie Armstrong believes the most important role on the school board is being an advocate for the district and applying business expertise and experience to move the district forward. Belynda Davenport feels we need to find ways to meet all their needs in education. Jamie Armstrong feels it is a two part issue. She feels we need more technology in general to let kids learn. She feels they need a curriculum that is geared toward modern skills. She feels the career pathways program needs revamped to match todays workers. Kevin Allen said you need to be involved to know what can be done with the money that is available. Jamie Armstrong wants to make Fort Scott a model for what a district can be. Kevin Allen wants to address the lack of interscholastic sports in the middle schools. He feels they have a plan that was put together that will save the school money and develop the program. Belynda Davenport – Biggest goal would be to follow the pathway set by the new superintendent and focus on student achievement to find what is going to help each and every student. Belynda Davenport closed by talking about her experience on the school board and pointed out that there are many things that are very positive in the district. She is excited about the new superintendent and Susan Brown heading up the finances. Kevin Allen closed by saying that he has been involved with the school system for some time as a volunteer. Talked about the need to repair the highschool and feels he can bring bluecollar thinking to look for ways to repair things efficiently. His main goal is to listen to everyone’s ideas and problems. Jamie Armstrong closed by asking people to take home the fact that she feels the school system is at the crossroads. She feels the leadership of Dr. Gross is the right thing for this time. She feels she brings management experience to the table. She feels that the decisions made by the school board are important for the school, but also for the community. Readinger opened by detailing his history and education in accounting and business. Townsend said he has lived here all his live other than the 4 years he was in the Navy. Said he is fortunate to live in a town that is a great place to live. Now that he is retired he feels he has the time to do the job and a willingness to learn. Hedges said he has been a part of the community since 1968 and involved in a number of different positions and wants to give back to the community that has been so good to his family. Fewins has been in this area fo 42 years. Is currently on the board of trustees and seeing another four years. Bartelsmeyer said he grew up working at his fathers jewelry store. He has previously been on the board and is running again to give back to the community. He values education. Colum is currently on the board and running again. She feels the college provides a number of opportunities to young people. Kerr was raised and educated here and decided to move back here to raise a family. He wants to restore the balance between the fiscal needs of the college and the financial needs of the families in the community. He said that a family’s purchasing power has gone down by 60% while the college has increased the tax burden on families by 35%. Conradt is new to the community having taken a job at the hospital. Has a background in accounting as a CPA. Was looking for a place that he could use his background to help the community. Stanton here to run for the board to better serve the communities vision and promote financial stability. Colum said she supports it because it wont happen very often. Kerr felt it was a reasonable decision, but doesn’t feel he has the input from all the public input that the trustees would receive. He feels it is limited enough and thinks it is critical to have real oversight and that if it is abused they need to get rid of it. Conradt said that alcohol is being served already so it was just a matter of changing the location and said that his experience is that serving alcohol can loosen the purse strings at fundraisers. Stanton said he has no objections and knows whoever is in charge of the events will make it a positive event. Bartelsmeyer doesn’t have a problem with it and things most other colleges have a similar policy and can help with fundraising. Fewins said they originally tabled the decision in order to look at it more closely. He eventually voted for it because he felt it is a good economic decision and felt it will be adult supervised. Hedges said that in the past the board voted it down but feels that with the additional buildings it isn’t a problem. Townsend said it shouldn’t be a problem. Readinger feels there are economic benefits and it can be used to earn revenue for the college. Stanton said the levy is adequate. It isn’ the mill levy that is the issue–it is the budget. We need to look at how the money is spent and he doesn’t support any increase and FSCC needs to refocus on the programs that are working the best and that have public support. Conradt said there is a balance that needs to be achieved and feels the economy is making this more of an issue than it should be right now and feels that the internet is going to make it easier to deliver education at a lower cost. Kerr said it is important to to look at the property valuations of the community. He said valuations have gone up 22%. He feels that since the college is bringing in more money, they were wrong to vote for an increase from taxpayers who were already struggling. He would not support an increase and will not vote to do so. Colum said they didn’t raise the mill levy last year. She said that the mill levy also supports jails and city commissioners. She said that the mill levy brings in a lot of revenue. Readinger said the college brought in over $100,000 more in taxes based on the increase of property values last year. He said that money is coming out of people’s pockets and feels it doesn’t need to go up. Townsend feels they are not high enough and says they will go up again eventually because things go up and not down. He feels the college is important and that the administration needs to be able to prove how important it is. Hedges said the cost per student is the lowest amount 19 other community colleges. He said that he would like to work with the board to come to a decision that makes sense and is transparent. Fewins said we didn’t raise the mill levy this year and they raised it in the past because the assessment had dropped and they didn’t get any more money and they were just trying to equalize it. He said local funding makes up 20% of the total funding. Bartelsmeyer said he can’t say if he would say to raise or lower it because it depends on why. Readinger said the government is spending money in ways that they can’t continue funding hirer education and expects that some sources of revenue will go away and the county won’t be able to replace all those funds. Townsend said the budget is an issue and it will be harder right now. He feels our grandkids will see a day where kids are not going to be able to step on a four year college campus until they have gone to a community college. Hedges feels there needs to be an emphasis on technical skills so students can support a family. Fewins said that over 40% of the hours here are vocational and those are more expensive than general education. He said they are looking at partnerships to keep costs down and that they are running about as efficent as they can. Bartelsmeyer feels vocation programs are important and need to be grown and that it is difficult to get and keep good faculty. Colum said students should come first and that they need to convince the community that they are good and doing the best they can for the students. Kerr said the community needs to understand how they are being good stewards of the community and feels they need to make better use of technology to reduce the cost of bricks and mortar. Conradt said that there is a prediction that 50% of colleges will fail in the next decade. He believes that FSCC needs to work hard to create internet based courses. Stanton feels the budget is the biggest issue and we need to take a closer look at what is working well and build on that. Bartelsmeyer closed by saying that the board needs to know the community needs, listen to concerns, support the college president, work as a team, look to the future, establish standards for the work, adopt fiscal policies for wise use of funds. Fewins thanked everyone and said the curent board of trustees has been trying to get people on campus. Says the next four years will be very challenging and is unsettled by what is happening on the state level. Feels FSCC is a bargain because students pay so little each semester. Hedges pointed out that 9 people running for 3 slots give votes some choices. He pointed out that the fine arts center was build from donors. Feels FSCC needs to be agressive in online education. Looking forward to serving this community on the board of trustees. Townsend said he might get confused by the number floating around. He said FSCC is a brightspot and the only thing that will keep the community afloat and attract work. He said we need more manual work jobs but technology is better of big cities. Said he has the time and willingness to help. Readinger said there are a lot of difference opinion about what the board should do. Feels the board needs to protect all the stakeholders. Said the cost of getting a degree has grown double the rate of inflation over the last 35 years. Said he has worked with a lot of budget and good management principles from business will help the college. Colum says she is a product of FSCC back when it was part of the Fort Scott public schools. Said she is impressed with the president and staff and that we should be proud of them. Proud to serve and contribute to FSCC. Kerr wants to be part of the Fort Scott community and feels FSCC plays an important role his kids education and the education of others. His purpose in running is making sure that the college is careful in how it spends money, pointed out that since 2003 the income to the college has gone up from 12 million to 23 million. Pointed out that when the valuation went down the board raised the mill levy, but didn’t lower it when the valuations went back up. Conradt said he’d be happy to meet with anyone to discuss the college. Pointed out that the college brings people to the area, provides students for the rental housing market in Fort Scott. His goal will be to make sure that education remains affordable for everyone. Would push for more online educational opportunities and to partner with other colleges. Stanton said he writes better than he speaks because of his FSCC English teacher. He wants to be a board member that is better connected with faculty and staff. Would like to see an increase in transparency by putting budget and monthly expenses on the website. Says the college needs to live within its means and keep the mill levy where it is att. Lucas Cosens wants to upgrade the downtown area. Feels our city can be great place to work, but only if we act now. Jim Adams is the current city major. He is up for re-election. He feels that there have been positive changes over the last four years and that the city is more transparent. He pointed out that the meeting times have been changed to let more people attend. JoLynne Stainbrook has been her for 45 years. Thinks community service is very important and has served on many other boards. Samuel Mason is a retired judge and wants to further the progress of the future of this community. Feels that progress is slow but sure to develop for the future. Samuel Mason agrees with this approach. Jim Adams feels the process works very well. Lucas Cosens feels it is a good way to go for our community. Lucas Cosens said he had a desire to give back to the community and serve the citizens of the town. He wants to help the city prosper. Jim Adams said he was originally frustrated with the lack of openness of the city government when he originally ran four years ago. He now wants to help continue the path that the city is on. JoLynne Stainbrook said that community service is her main reason for running, but that it is also important for everyone to work together and she wants to be part of that. Samuel Mason said he has no issues, but that the commission is working for the people and that they can answer people’s questions. Pointed out that they haven’t raised the mill levy in four years and hope to keep that flat. Samuel Mason said that is why they hired a city manager and economic development director. He said the four line highway will help. Jolynne Stainbrook said it is important for people to work together and to have incentives for people to work together and hopefully attract people to move back to Fort Scott. Jim Adams feels we are doing a pretty good job considering the economic downturn from the past years. He pointed out a number of businesses have been coming to town. Lucas Cosens feels the highway will be an improvement. He pointed out that the lack of highspeed internet is making it harder for some businesses to come to town. He spoke of issues with the airport because he feels some businesses look at the airport. Jim Adams closed by saying he would be happy to sit down and talk to anyone one on one about any issues. He pointed out that we now have fiber running into town that can help with the highspeed internet and another company is coming. He feels we have made great strides toward bringing people in with great ideas to help move things forward. JoLynne Stainbrook said she is up to the challenge of the city commission role and feels that economic development is very important. She pointed to her work to keep the the public transportation. Samuel Mason said that in the 60s three people from the town went to KU to talk about city manager type government. It originally failed, but several years later it passed. Asked people to vote for him again, said he has the time to work with anyone on any issue to help Fort Scott. Lucas Cosens said his roots run deep in the historical foundations of the community. Said he is at least a fourth generation FortScotian. Wants to be an advocate for the people. Wants the city to grow because he loves Fort Scott.